We are going as big as possible for today's Taxon of the Day with an entry on the world's largest land mammal. Loxodonta africana (Blumenbach, 1797) or African elephant is not only one of the most significant and well know mammals on earth but also until relatively recently, along with the Asian elephant Elephas maximus (Linnaeus, 1758) one of only two recognised elephant species. Then in 2010 a third species of elephant, Loxodonta cyclotis (Matschie,1900) was described. This separation between the smaller African forest elephant and the larger African bush elephant means numbers of Elephant species have significantly increased, although unfortunately, numbers of elephants themselves have not. The difference between the two? 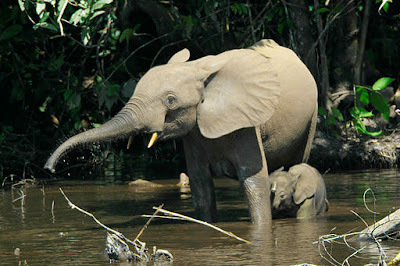 Well apart from overall size, the African forest elephants have a long and narrow mandible (jawbone) whereas the African bush elephants have a short, wide one. Loxodonta along with Elephas, are the only two living genera in the family Elephantidae, which is the only living family in the order Proboscidea. All three species of elephant can be found in the Catalogue of Life supplied by the ITIS database.